In just a few short weeks, as we are doing here at the mid-point of Great Lent, we will once again find ourselves at the foot of the cross…gazing up at our Savior who gave up everything, in order to save His own creation. Today, He who hung the earth upon the waters, is now hung upon the cross. He who is the King of the angels, is arrayed in a crown of thorns. He who in the Jordan set Adam free, now receives blows upon His face. The bridegroom of the Church, is transfixed with nails. O Christ….We venerate Thy Passion. What does the cross mean for us? To the fallen world…it means nothing. A simple instrument used thousands of years ago to punish murderers. But to us…dearest brothers and sisters in Christ…The Cross is everything! We read this morning from the words of our Lord: “Whoever desires to come after me, let him deny himself, take up his cross, and follow me!” Just as our Lord had to suffer through hardships in order to show His love towards mankind, so we too must also bear and overcome our own personal hardships through this life…not falling into despair or complaining when things don’t go our way, but rather relying on the hope that our Lord provided us on Golgotha. There is no other way to follow Christ, than to suffer for His sake…because that is what he did for us. We bear our God given crosses in this life in the same way that Jesus bore His cross…with humility, perseverance, and hope in the resurrection. With that being said, why does it always feel like the crosses that we have been asked to bear through life seem so difficult…and so heavy? Why is it that it seems that others have better lives than us? Why are their hardships so miniscule when compared to ours? Why does a denial of ourselves and a willingness to pick up our Crosses and follow Christ…have to be so difficult? I’m sure that each of us can point to a day in our life, where rather than bearing our passions and difficulties, it feels as if our ankles are tied to them and they are dragging us through life…as our bodies hit and bounce out of every Michigan sized pothole that the world can throw at us. 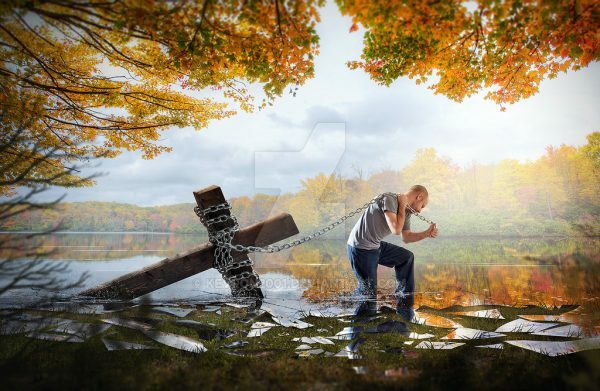 Brothers and sisters in Christ, if we don’t have the eyes of faith to understand what the cross of Christ means to us…if our Lord’s sacrifice and love is not the single most important thing going on in our lives, then the smallest crosses will seem like the biggest burdens. When our faith is weak and it is not infused with the hope of the resurrection, even the smallest daggers that the devil throws at us will kill us. But if we keep the cross always in our minds, when we see how beautiful it is, when we contemplate on the fruits that it has given us, when we realize the enormity of the cross that the creator of all bore for the sake of his fallen creation, and when we see that it is our God Given crosses which provide for us a bridge to the life-saving passion of our savior…all of our struggles through life can be more freely embraced, and they become easier to bear.